Looking to save money on your Florida auto insurance? You might not have known that you can save up to 15% by taking a mature driver course. The best way to take this course is online, since you can complete the entire course in the comfort and security of your own home or office. The course is fully approved by the State of Florida and accepted by Florida insurers. It just takes a few minutes to sign up. Click the green register button to start out on the road to savings, or click the details button if you'd like to know more about the course first. "The short amount of time I spent in your mature driver course was a good investment." 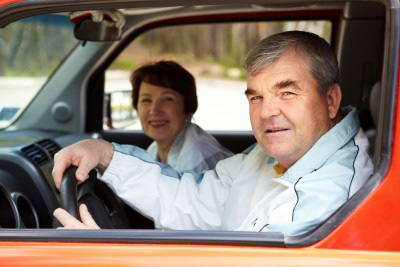 The mature driver course can be taken by any Florida driver age 55 and older. State law (§627.0652, F.S.) authorizes Florida insurance companies to grant a discount to any qualified driver who completes the 6-hour mature driver course whether online or in the classroom. Easy course for everyone, not just "computer experts"
While the main reason most Florida drivers take a mature driver course is to save money on their auto insurance, they might not realize that they are also receiving even more important benefits. Studies have shown that many drivers who complete driver improvement courses are less likely to be involved in traffic crashes or receive tickets for moving violations. Just what makes these courses so beneficial? The answer is a change in attitude. The purpose of driver improvement is not to teach you driving skills or rules of the road, although part of the course includes a refresher on these subjects. Instead, the main focus of driver improvement is recognizing that adjusting one's attitude can result in safer driving for everybody. So you can think of the mature driver course as not just a way to get an insurance discount, but also as a way of becoming a safer, more knowledgable driver. Florida's First Traffic School is owned and operated by Driver Training Associates, Inc. DTA has been on the cutting edge of driver improvement for longer than most other online or classroom based driver improvement providers have been in business. We specialize in Florida courses such as basic and advanced driver improvement, driver education, and court-ordered traffic school. Our office is located in Winter Haven, Florida, and several colleges, traffic schools, governmental bodies, and other entities throughout Florida use our programs. Remember Florida'sFirstTrafficSchool.com for ALL of your Florida traffic school and defensive driving needs!